"Young and Healthy" "You're Getting to Be a Habit with Me" "We're in the Money" "Lullaby of Broadway" "Shuffle Off to Buffalo" "42nd Street"
Producer David Merrick took a huge gamble with his $3 million production based on the 1933 Warner Brothers film musical 42ND STREET; only one other show had made the transfer from original movie musical to the stage — “Gigi,” a flop in 1974. But Merrick hedged his bets by hiring the director/choreographer Gower Champion, whose instinct for showstoppers made him an ideal choice for the dozen production numbers in “42nd Street.” The score helped itself to the songs written for the film by Harry Warren and Al Dubin, two of the most acclaimed film composers of the 1930s, and also borrowed liberally from their catalogue. The show itself was a jazzy, noisy paean to the transcendent joys of Broadway. The Great White Way’s most brilliant director, Julian Marsh, is preparing his biggest show yet, “Pretty Lady,” in the depths of the Great Depression. He is faced with one obstacle after another, especially when his leading lady breaks her ankle at the last minute; of course, young chorine Peggy Sawyer is pushed unexpectedly center stage and becomes a surprise star on opening night. Unlike the show itself, the real event did not have a happy ending — Champion died on opening night in August 1980, leaving behind a stunned theater community and the greatest hit of his career. It was the final curtain for one era and the overture for another. 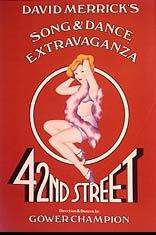 Although the show would move out of the Winter Garden within two years, “42nd Street” would be the last American musical to play that theater for the next 25 years; it would also be the only American musical to play close to 3,500 performances for the next 22 years.